At Sharrons Event Catering Company, we understand that nothing compliments a great party or event as much as a fully stocked and professionally run Outside Bar. Our mission is to offer the best Outside Bar service to you. Sharrons Event Catering Company can supply outside bars across all of London and the south east of England including, Essex, Hertfordshire, Kent and surrounding areas. Our outside bars are free standing for use in your own venues or we can provide all the staff and equipment needed to run a bar already located at the venue of your choice. Our Events team can arrange to obtain a Temporary Event Notice (TEN) under the legislation covered by the Licensing Act 2003, given a minimum of three week’s notice. We supply a full range of beverages including Larger, Beers, Wine, Champagne, Spirits and Bottled drinks, with notice we will also supply any unusual drink requirements. We only use experienced outside bar staff and provide all of your Glass hire needs including Champagne Glasses, Wine Glasses, Pint and half pint glasses, Highball glasses, and if you require we can supply good quality disposable glasses. We will provide a full cash bar service or if you require we will provide a credit bar service where we will keep a tally of the drinks served against a pre agreed limit or if you require we can organized a part prepaid and then a cash bar service, the choice is yours. Having extensive experience in the hospitality industry, our events team know exactly what it takes to organize Outside bar services for a whole range of events from Wedding Receptions, Birthday Parties, Christenings, Anniversaries, Funerals, Corporate Meetings, Corporate Hospitality Events, Corporate Product Launches, Work Fun Days and many other types of event. A set up and booking fee of £150 is payable to confirm your booking. Final numbers and any outstanding hire charge should be with us 14 days prior to the event. 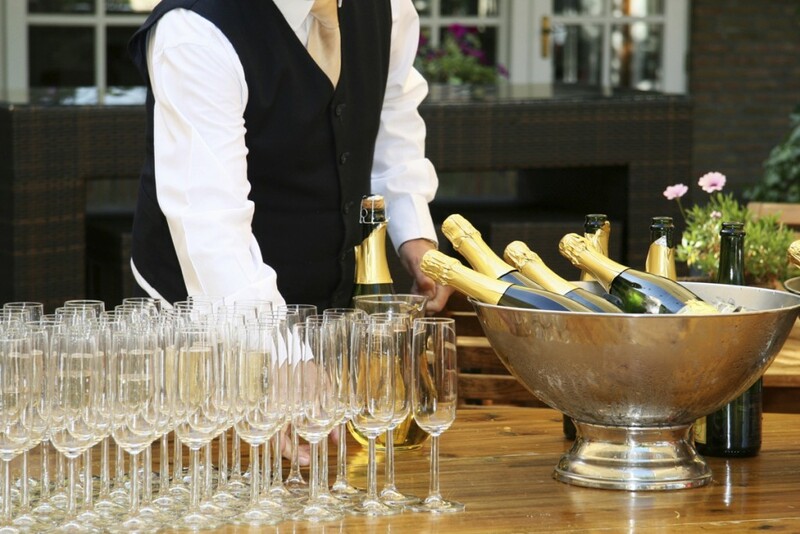 A corkage charge may apply for any drinks not supplied by Sharrons Event Catering Company. We reserve the right to discontinue bar service should there be any disruptive or irresponsible behaviour. The client will be liable for any excessive loss, breakages, damages or injury that may be attributed to them during the course of an event. If you are having parties or events in London and the south east of England including, Essex, Hertfordshire, Kent and surrounding areas, and you require an outside Bar, no matter how simple or complex your outside bar requirements, please do call or email Sharrons Event Catering Company’s friendly event team to discuss your needs.